Flooring in an important element in every home. The choice of flooring for a room is an important decision every homeowner must make. Many factors should be taken into account when making this important decision. The following information will help you learn the basics about hardwood vs. laminate flooring so you can make the choice that works best for you and your family. Laminate flooring is far less expensive than hardwood is. In some instances, consumers can spend 50 percent less on laminate floors. The great discrepancy is largely due to the materials from which both types of flooring are produced. Laminate flooring is made from composite wood that is pressed together at a high temperature while hardwood floors are created from harvested trees. Laminate floors are far more durable than hardwood floors are. Since laminate floors are made from pressed wood, they are more resistant to scratches, moisture, and general wear and tear. On the other hand, hardwood floors are easily scratched and can become damaged when they are exposed to excessive moisture. Hardwood floors also show wear and tear, especially in high-traffic areas. 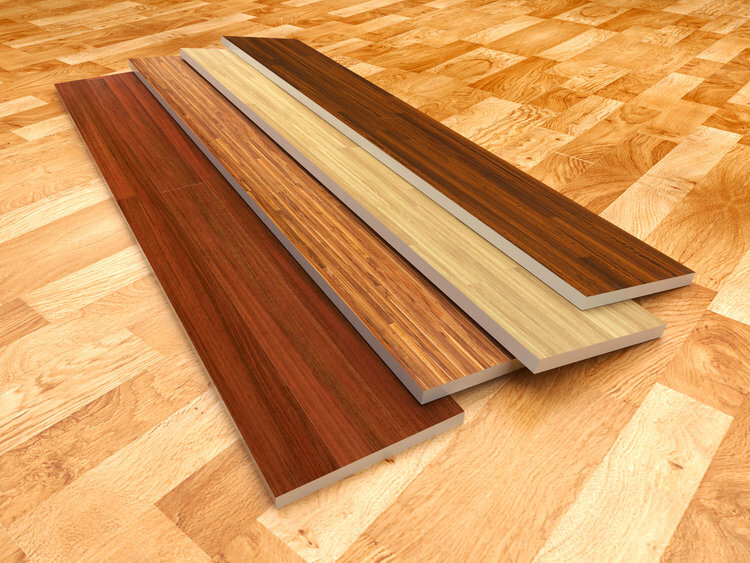 Laminate flooring is made from lower-quality materials, and it shows in its appearance. Hardwood floors have a far more impressive visual appeal. Since hardwood is made from real wood, the natural beauty shines through. Installing hardwood floors can even add to the overall value of a home. Laminate flooring is easy to care for. It simply needs to be swept, dry mopped, or wiped with a damp cloth. Hardwood floors demand a little extra effort to maintain. They require special cleaning agents that are designed to preserve and restore the finish of the hardwood. Although it may be tempting to use a universal cleaner that can be purchased from a local market, these cleaners are often too harsh for the hardwood and can be damaging, making the floor look dull. Laminate floors cannot be sanded and refinished, so the wear and tear of everyday life builds on them, and the scuffs and scratches begin to destroy the floor. Laminate floors have a lifespan of approximately 20 years. At that point, the laminate begins to wear down, and it will likely need to be replaced. Hardwood floors have a much longer lifespan. If they are maintained well, they can last anywhere from 40-80 years. When the finish wears down on a hardwood floor, it can easily be sanded and refinished. A solid hardwood floor can be sanded and refinished six to seven times in its lifespan. Laminate flooring is difficult to repair. It is possible to remove small sections of the laminate floor if it is the type that snaps together. However, homeowners run the risk of having the new pieces not be an exact match. On the other hand, hardwood floors can be repaired by sanding out the damaged areas and then refinishing the floor. The laminate that is used to create floors is created by bonding various composites together with melamine resin. The process requires pressure and high temperatures. There are few, if any, organic materials used in created these floors. So, making laminate floors takes a greater toll on the environment. Solid hardwood floors are created using nothing but organic materials since they are produced from single pieces of wood. Further, European and American hardwood floor manufacturers adhere to strict standards that are set by the flooring industry. Following these standards ensures that the floors contain no harmful VOC emissions and use glues that do not contain formaldehyde. Laminate flooring often consists of tongue and groove planks that must be matched up as they are laid down. Some hardwood floors maintain the old style of installation that requires cutting planks to the appropriate size and then nailing, stapling, or gluing them together. However, most hardwood floors are pre-cut into tongue and groove planks that snap together. Both types of flooring require precise detail in their installations. It is best for homeowners to hire professional flooring installers for both laminate and hardwood flooring unless they are skilled flooring installers themselves. Both laminate and hardwood floors have benefits and concerns. The choice between the two is ultimately up to the homeowner to decide which qualities are the most important. If you have questions regarding the benefits of hardwood floors and how they can enhance your New Jersey area home, consult with a local professional to find out more.